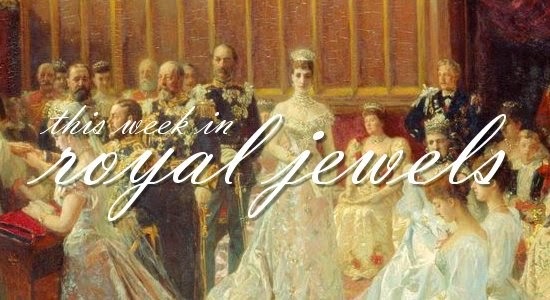 Time for another week's worth of royal jewels! Enjoy! 10. Queen Elizabeth II has been in Wales this week. On Tuesday, she wore the Pearl Trefoil Brooch for a visit to the Royal Dockyard Chapel. 9. While Elizabeth has been in Wales, Queen Sofia of Spain made the rounds in London, where she inaugurated a library in her name at the Cervantes Institute on Wednesday. A photographer at the event snapped this close-up photograph of her watch, bracelet, and rings -- note the evil eye motif in the bracelet she wears on her right wrist. 8. Grand Duchess Maria Teresa of Luxembourg and Queen Sofia were among the royal women who attended the canonization mass at the Vatican on Sunday. Both women took advantage of their right to wear white in the presence of the pope, the privilège du blanc, as did another spouse of a (former) Catholic sovereign, Queen Paola of Belgium. Sofia matched a pearl necklace with her white dress and lace mantilla, a good choice for a white ensemble during a daytime religious ceremony. 7. During her state visit to China, Queen Margrethe II of Denmark wore earrings that stood out against her gray-blue dress and hat while visiting the Songzhu Temple in Beijing. 6. On Thursday, Queen Elizabeth visited Ystrad Mynach to conclude her Welsh visit. She chose to wear a piece of jewelry that has been in her personal collection for more than half a century: the Flame Lily Brooch, given to her on her twenty-first birthday by the Children of Southern Rhodesia. 5. Wednesday saw the continuation of King Philippe and Queen Mathilde of the Belgians' introductory visits to other countries; this time, the couple visited Norway. Mathilde paired a coordinating set of jewels, including earrings and a bracelet, with the dress she wore to the princely wedding in Monaco in 2011. 4. King Carl XVI Gustaf of Sweden turned 68 on Wednesday, and the family was out in force on the balcony for the occasion. Queen Silvia wore a stylized bow brooch to celebrate, and Estelle wore an actual bow, presumably for the same reason. 3. On Wednesday, Princess Michael of Kent chose a rather enormous beaded necklace to attend the opening of the "The Road to the Crown - The Kingdom of Hanover and Its Rulers," an exhibit at Schloss Marienburg that is a part of the celebrations of the anniversary of the personal union between Hanover and Britain. 2. Princess Charlene of Monaco has been in America this week; on Tuesday, she accepted an award in Beverly Hills at The Colleagues' 26th Annual Spring Luncheon. And, praise be, she seems to be slowly dipping her toes further into the royal jewel waters, as she donned not only earrings but also a sparkling bracelet at the event. 1. For the first King's Day of Willem-Alexander's reign, Queen Maxima of the Netherlands went to her go-to gemstone: aquamarines, this time suspended from a pair of diamond earrings.